I can easily see why some would want to call me a contrarian, but my goal is to always be open and honest about what I do and don't like. And if a majority of those opinions go against the grain, then so be it. Let's take 2004's The Incredibles for example. The film was lauded by critics, was a box-office smash, and won the Oscar for Best Animated Feature. And all of this baffled me. People were falling over themselves to praise the film for its originality, but all that I saw was a movie which was a unabashed rip-off of The Fantastic Four, Watchmen, and any number of James Bond movies. Sure, it looked great and there were some funny moments, but the praise was not earned. So, as Pixar continues their parade of sequels and we now get The Incredibles 2, I couldn't wait to see if it was more of the same. The Incredibles 2 picks up right where the first film ended. Mr. 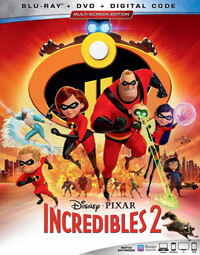 Incredible AKA Bob Parr (voiced by Craig T. Nelson) and his wife, Elastigirl AKA Helen Parr (voiced by Holly Hunter) are fighting the Underminer (voiced by John Ratzenberger) with the aid of their kids, Violet (voiced by Sarah Vowell) and Dash (voiced by Huckleberry Milner). This event leads to some destruction of public property, which reinforces the idea that superheroes should be outlawed. Bb and Helen are soon contacted by Winston Deavor (voiced by Bob Odenkirk), an entrepreneur who would like to see super heroes get the recognition which they deserve. Along with his tech-wizard sister, Evelyn (voiced by Catherine Keener), Winston wants Helen to be the face of a new public image campaign for super heroes. While Helen is out fighting crime and facing offer against a new villain called Screenslaver. Meanwhile, Bog assumes all of the household duties and learns that single-parenting may be more difficult than stopping bad guys. As evidenced by the above rant, The Incredibles set the bar pretty low, so I wasn’t expecting much from the sequel. (Sure, it made twice as much money as the original, but that doesn’t guarantee quality, now does it?) Perhaps because there were so few expectations, I didn’t find this second chapter as grating as the first. I knew going in to not expect much in the way of originality, and the film didn’t disappoint in that regard. Again, we’ve got a group of characters whose powers are blatantly stolen from pre-existing comic book heroes and we are once again placed in a world which is reminiscent of Watchmen. The story is hackneyed and this must be a movie aimed at children, as any adult is going to see the “twist” coming from a mile away. In a climate where we are bombarded with super heroes movies, you would think that The Incredibles 2 would try to do something different. Given all of those negatives, I still found The Incredibles 2 to be somewhat fun for the simple fact that it doesn’t take itself as seriously as the first film. The whole thing with Syndrome and his sinister island in The Incredibles got a bit too far-fetched. Sure, there are plenty of wild things going on in this sequel, but the overall sense of the film’s “reality” is more even-keeled. While Kari’s comic relief is sorely missed, there are some funny moments here, most notably a scene involving a raccoon. And this movie is more on-the-mark with its exploration of a family of super-heroes. In the first film, that was sort of a gimmick, but here, we get a better sense of how the Parr’s work as a group. In many ways, my views on The Incredibles 2 are similar to my thoughts on the first film -- If you know nothing about comics, then you’ll probably enjoy it. But, if you are hip to classic super-hero tales, you’ll question the film’s lack of originality. The Incredibles 2 could have used more Frozone on Blu-ray Disc courtesy of Walt Disney Studios Home Entertainment. The film has been letterboxed at 2.35:1 and the Disc contains an AVC 1080p HD transfer which runs at an average of 21 Mbps. (That's a shockingly low bitrate for a movie like this, especially when one considers that most of the extras are on a separate disc.) The image is very sharp and clear, showing no overt grain and no defects from the source materials. The colors look very good and the image is never overly dark or bright. The level of detail is excellent and we can see the work which went into creating depth and textures on objects. The Disc carries a DTS-HD Master Audio 7.1 track which runs at 48 kHz and an average of 5.0 Mbps. The track provides clear dialogue and sound effects. The action sequences provides strong surround sound and subwoofer effects. The rear-channel examples deliver detailed sounds and the bass adds "oomph" to the explosions. The stereo effects highlight sounds coming from off-screen. The Incredibles 2 Blu-ray Disc contains several extra features. Disc 1 kicks off with an AUDIO COMMENTARY from Writer/Director Brad Bird, Animation Supervisor Dave Mullins, Animation Supervisor Alan Barillaro, Animation Supervisor Tony Fucile, and Animation Second Unit Bret Parker. "Bao" (8 minutes), is an interesting and somewhat freaky short film. "Auntie Edna" (5 minutes) is another short, which plays more like a deleted section of the film. "Strong Coffee" A Lesson in Animation with Brad Bird" (19 minutes) is a making-of featurette which focuses on Bird. We hear from many members of the creative team who worked on the film, as we get a first-hand look at production meetings. We also hear from Bird himself, as he discusses his history in animation. The remainder of the extras are found on the second Blu-ray Disc. "Super Stuff" (7 minutes) provides an overview of the film's aesthetic and the themes in the story. "Paths to Pixar: Everyday Heroes" (12 minutes) looks at how the situations and characters in the film reflect real-life family events as related by the film's crew. "Superbaby" (5 minutes) is a brief segment in which two annoying kids interview Fucile. "Ralph Eggleston: Production Designer" (2 minutes) is a short interview with the aforementioned Ralph. "Making Bao" (6 minutes) focuses on the short found on the other disc. "Heroes & Villains" (26 minutes) is a series of eight short segments which focus on specific characters, in which we hear from the actors and the animators. "Vintage Features" offers fake toy commercials and theme songs for the main characters. We get ten DELETED SCENES which run about 40 minutes, complete with an introduction by Bird. The high-point here is that the absence of Kari is explained. Finally, we get three TRAILERS and a promo reel entitled "Super Moments" (4 minutes).